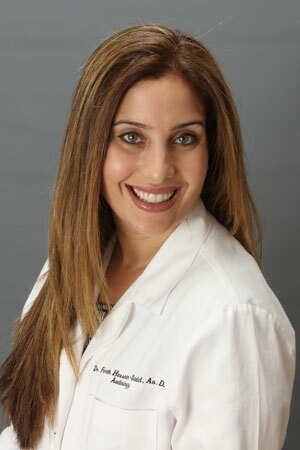 Dr. Farah M.H. Said, Au.D, F-AAA (Fellow of the American Academy of Audiology), graduated from the University of Delaware with a Bachelor’s degree in Neuroscience, where she developed an interest in the biologic and neural mechanisms of the auditory system. She then went on to obtain her Doctorate in Audiology from Pennsylvania College of Audiology (now known as the George S. Osborne College of Audiology at Salus University). During her studies, she was presented with the award for the Best Grand Rounds Presentation. Farah completed rigorous clinical training at Pennsylvania Ear Institute as well as several local audiologist and ENT private practices. She completed a demanding 4th year audiology residency internship at the Robert Wood Johnson University Hospital in New Brunswick, NJ. During her residency, she was exposed to a wide array of pathology at this large tertiary care academic facility, while functioning in an interdisciplinary team made up of Audiologists, Speech Pathologists, and ENT physicians. Dr. Said has a specific interest in ototoxicity monitoring, and has published a May 2008 article in Advance for Audiologists entitled “Audiologist’s Role in Ototoxicity Monitoring.” During her residency, she was presented with an award for exceptional professionalism.